The NYSAC Women's Leadership Council is the only statewide program focused specifically on providing support to women in county government. SYRACUSE- The NYS Association of Counties (NYSAC) Women's Leadership Council gathered last week for the Meeting of the Minds series of non-partisan round table discussions. The Women's Leadership Council is the only statewide program focused specifically on providing support to women in county government. Topics covered by the group included raising campaign funds, careers in county government, managing conflict in heated times, mentoring, and the unique challenges faced by women in public office. The NYSAC Women's Leadership Council is the first and only program in New York State focused specifically on providing support and training to women in serving in public office at the county level. "It was an honor to connect with my colleagues to support women in county government, and to share our experiences, challenges, and triumphs as women in public office. 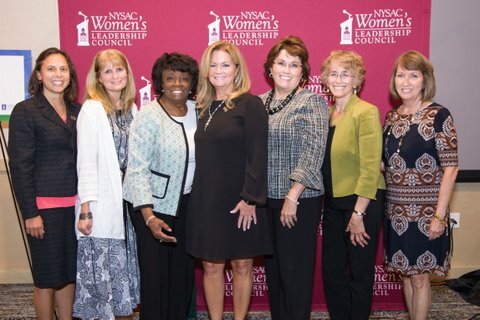 The Women's Leadership Council will continue doing important work moving forward," said MaryEllen Odell, Putnam County Executive and NYSAC President. The Women's Leadership Council launch earlier this year coincides with the 100th anniversary of New York State signing women's suffrage into law, three years before the ratification of the 19th Amendment granting all United States women the right to vote.